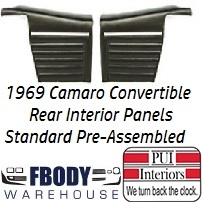 This is a pair of new replacement standard rear interior trim panels for use on 1969 Camaro with standard interior and CONVERTIBLE models only. Units are available in 6 different factory colors and these are the PRE-assembled version which does include the chrome like molding. Use the drop down menu to select the color you need.